For v.2017 only. Nesting shapes has always been a tough job for a macro. Finally GDG Nest to the rescue. The nesting operation can take up to a second per shape depending on the options you have chosen, but is significantly faster depending on your computer's speed. The tiling option is extremely fast and can put hundreds of shapes in a specified area, very quickly. Additional options include speed testing timer, make a duplicate of files for nest, rotate 90 and 45, and more. An awesome bonus shape randomizer macro is included. It's a whole extra macro built right in! Randomize shapes position in an area, color based on a palette, x and y position, and rotation. Note: Nest feature can be slow depending on shapes and options. You can also use the ultra fast quick tile feature which works similar to nesting and processes hundreds of shapes quickly. 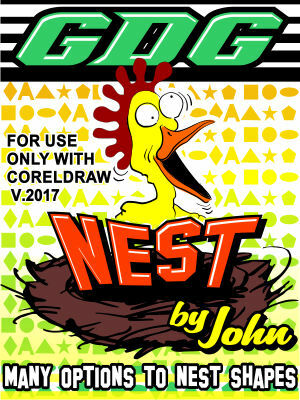 This is the only CorelDraw macro, yes a macro using the built in VBA, that can nest shapes! This version is for v.2017 only.